Costs and budget – Interested in Learning How to Find, Select and Eventually Live On Board Your Own Sailboat? You're in the Right Place…. So, the Coast Guard sent you the approval email…..how exciting !!! But now what ??? Don’t forget the clock is ticking and you probably only have a week, or less, before your approved departure date arrives. Our courtesy flag flying !! Hopefully, by the time the email arrives you will already have a Quarantine flag, a Cuban courtesy flag, a cruising guide or two, (I had read our cruising guide once or twice before we even applied) and charts. If not, you can order them here…..
Mike taking down our courtesy flag after we cleared in. In addition, you should have an appropriate supply of spare parts, provisions and done some sort of shakedown trip to bebug any known or unknown issues you might have. You can buy food in Cuba but it’s more fun to explore and try out the local spots than to have to shop, parts would be VERY difficult….parts from the US would be almost impossible. 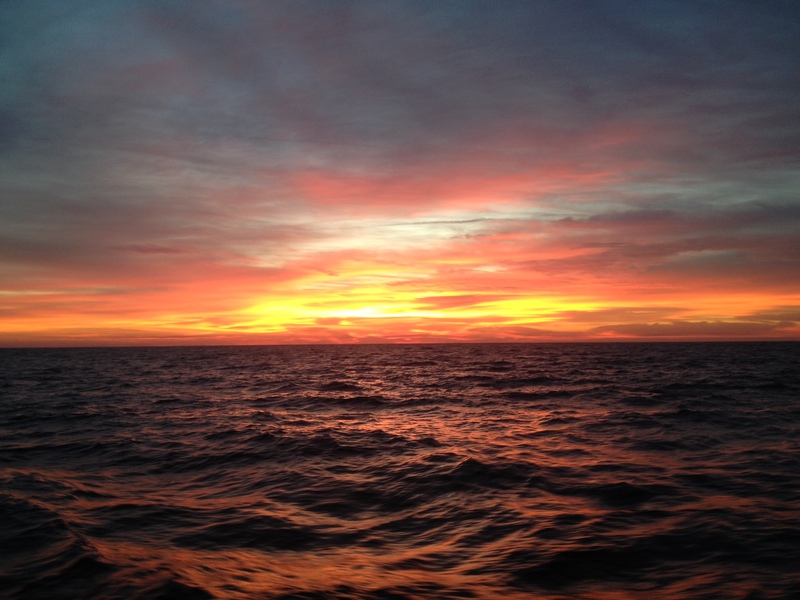 First things first…..start checking the weather…..this will be the most limiting factor for your passage and may force you to adjust your departure date with the USCG, so watch it closely. Before we left for Cuba we met a nice gentleman in a local Marathon bar. We overheard him say he owned a Hunter 35 (which was the same model Mike previously owned) so a boat conversation promptly erupted. He asked where we here headed and we said “Hopefully Cuba! !” He said he planned to leave for Cuba and keep going south as his boat was his only possession and he had no family to keep him in the states. Since he didn’t plan on returning he wasn’t going to bother getting a permit from the Coast Guard. He planned to leave near the end of March and we told him we would see him there. Once we arrived in Cuba there was an extended period of moderately heavy to heavy North wind. It was so bad that the St. Pete to Havana race was almost cancelled. They delayed the start of the race by a day and a record was set in the spinnaker class for completion of the trip. That boat shaved about seven hours off the old record if that gives you any idea what the winds were like. Once the North winds exceed 15 knots for a certain amount of time the Hemingway Marina stops allowing boats to enter or exit as it becomes quite hazardous. The entry channel is bordered by shallow rocks on either side and between the countercurrents from the Gulfstream (which at the time was very close to the north shore of Cuba) and the wind it can be difficult to avoid broaching (being turned sideways from wind and waves on the stern) and crashing into the rocks. Plus the North shore of Cuba is mostly Reef, rocks and shoals, then add to that, the depth goes from 1000′ to about 50′ in less than half a mile and it can be very dicey. After the St. Pete racers arrived and departed the North winds again increased. We heard a story about a sailboat that had apparently exited the Gulfstream to the east of the marina channel and had attempted to work it’s way back West along the shoreline to the channel. The winds had again become pretty heavy, the swells out of the North were still very strong, the boat was unable to sail or power away and the boat was pushed up onto the Reef. 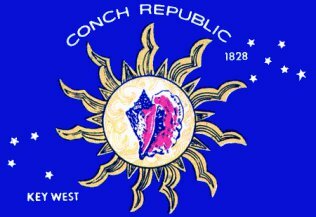 Upon returning to Marathon in the Florida Keys we learned that it was the man we had met in the bar just before we left. 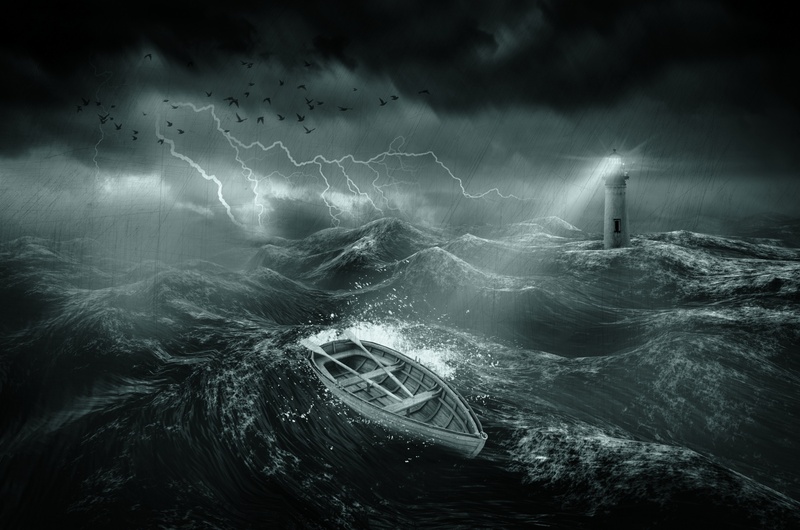 His boat had been trapped on the Reef for a few days and then a series of heavier swells had pushed it into a deeper pocket between the outer and the inner Reef. 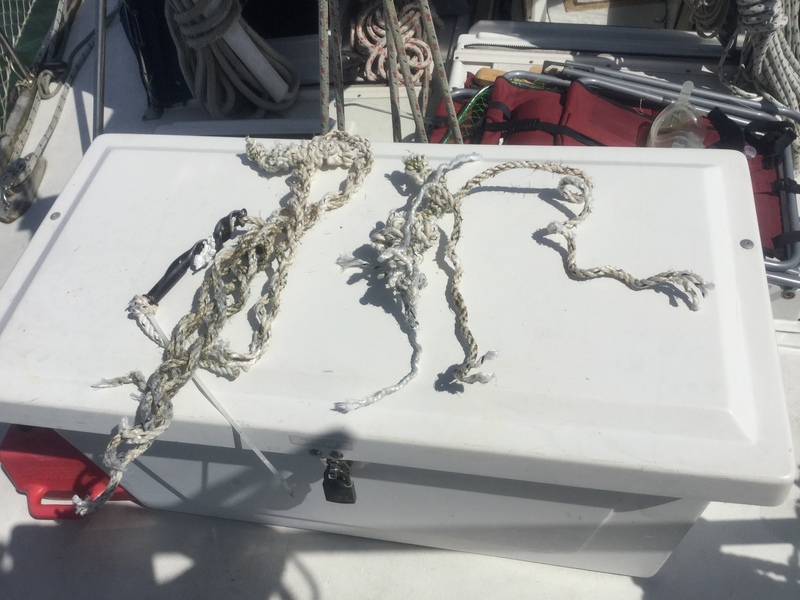 Unfortunately, there isn’t a channel or passage out of this area so his boat was damaged and then trapped in a pocket of deep water inside the two Reef areas. We haven’t heard anymore updates but it seems his boat will be a complete loss. Even if he had insurance, American based insurance companies offer no coverage in Cuba. Until March of 2019, two companies had offered special riders for Cuba coverage but they ceased to offer that citing “declining diplomatic relations”. Just before we departed Cuba, a second boat, a catamaran enroute to Key West from Mexico, was forced into Havana harbor by rough seas and high winds and later relocated to Marina Hemingway once the winds subsided. 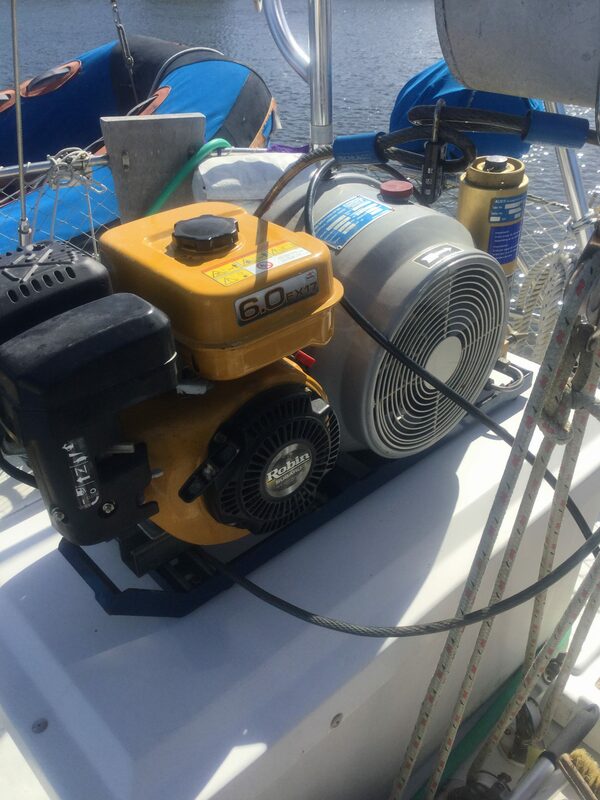 So, it’s weather, weather, weather….and make sure your engine and drivetrain are up to the challenge should you end up with a Lee shore and need the power to make a getaway. You hear a lot of odd stories about what to take to Cuba if you’re interested in giving gifts away. We have heard people say that “hygiene products” were popular gifts as they are difficult to obtain in Cuba….or some sort of perfumes or other toiletries for women were in demand……..we didn’t see, or hear of, that. Some of those stories also came with sort of an underlying, unseemly motive for those types of “gifts”, so avoid that. Cuba has changed quite a bit. Cellphones and social media are common. Personal items may be slightly more expensive but are readily available. Wifi, while usually available at parks or restaurants by the hour, isn’t overly common at residences. Even at a park or other location with wifi you have to buy a wifi card and then it’s $1.50 CUC (the tourist currency) for an hour of usage. Funny side note…most Cubans pronounce it “wee-fee” so the traditional pronunciation can lead to some confused looks. I asked a few people we befriended if there were any items that we, as Americans, might take for granted that were difficult to obtain in Cuba today and they said no. What we did find was that American products that don’t get imported to Cuba are interesting as a novelty. We took a few extra bottles of bourbon which we gave as gifts to some people, a case of Budweiser we traded for a case of Cristal beer and we had some baseball shirts and extra hats on board that we gave away to some of the people we met who had kids involved in baseball. They were very grateful for the gifts as they love American sports teams in Cuba. 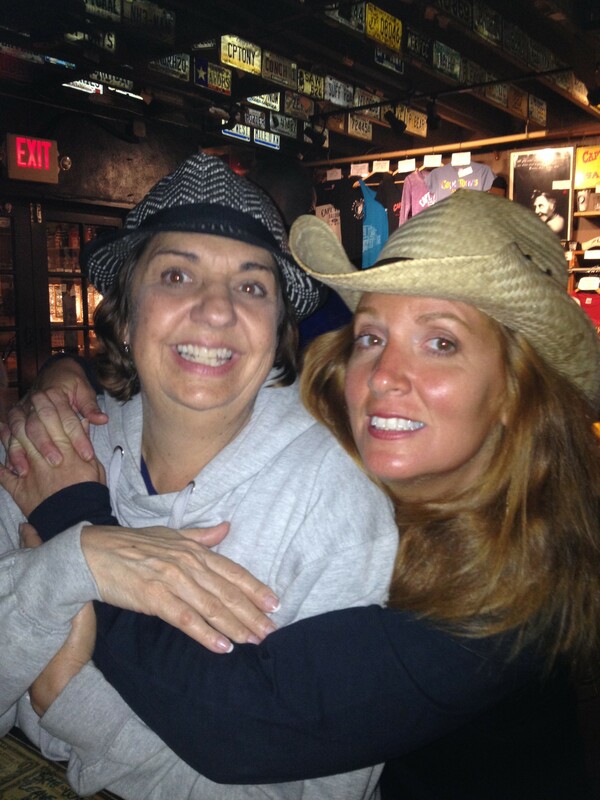 this one’s for Barb Lienhard ….Happy Birthday !!! There’s also a lot of talk about what kind of currency to take with you. People often exchange US dollars for Euros in the states to avoid some of the penalties charged at official outlets when exchanging US currency. Save your time and just take US dollars. You can tip in USD until you get your exchange finished. Take plenty of $5’s for the tips. Customs and Immigration won’t ask for a tip, or expect one, but the dockmaster, the electrician (who has to connect your shorepower), the agriculture officer and the health inspector will all say “the fee is $X and if you’d like to include a gift we would appreciate it”. Plenty of people laugh at them and give nothing but the goodwill was well worth the small price. We got plenty of visits from people asking if we wanted or needed anything and we saved about $300 on the stuff we bought to bring back (rum and cigars). In the next post we will tell you where to go to get the best exchange rates, pay 0 penalty AND get a better rate. Plus if you go to the right spots to eat you’ll be paying the lesser amount for food in pesos which is $1USD to $25CUP (the locals currency) as opposed to $.90 USD to $1CUC. Three of us had lunch and beers one day at a local place for $8USD. What about the language barrier? English is taught in Cuban schools, but like any second language taught anywhere, if it goes unused it is lost. A lot of Cubans in the marina area speak English very well. Download an English to Spanish dictionary to your phone, buy a copy of Spanish for Cruisers and learn some key phrases. Almost every menu is in Spanish….it helps to know what Cerdo, a chuleta and a pescadore are and how to get directions helps……We made some cheat sheets to review and assist the crew. I had a few years of Spanish in high school and fortunately a lot of it stuck with me…comprehension is easier and after a few days I can carry out a decent conversation. Last, but not least, is route planning. Hopefully, you’ll have moderate east or west winds, we had light south winds, in between bouts of heavy north winds, so we ended up motoring the whole way. If you have the time, or the inclination, I would go as far West as you can before leaving the Keys. If your weather window is big enough, go to Dry Tortugas for a day or two. 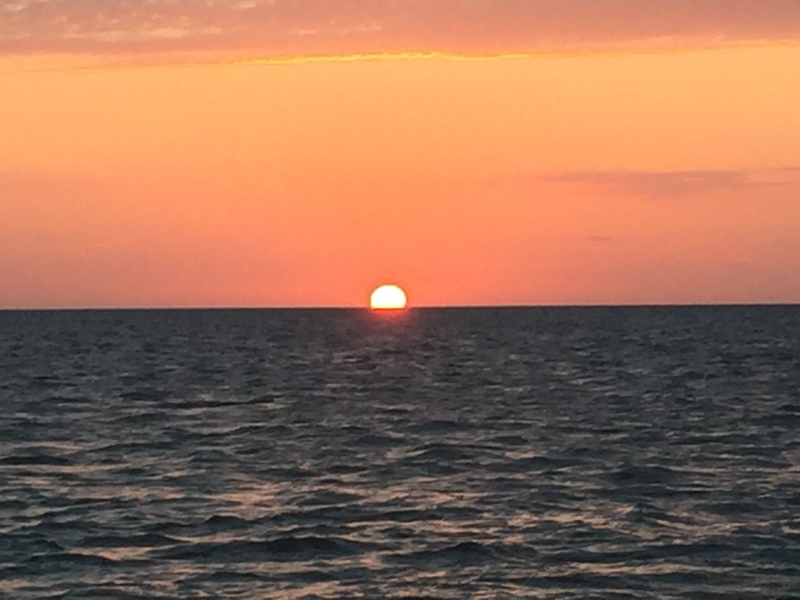 There’s a blog post for Dry Tortugas for any newbies. That way you will already have made some distance to the west and then join the flow of the Gulfstream, rather than fighting it, and make your final part of the ride smoother and faster. 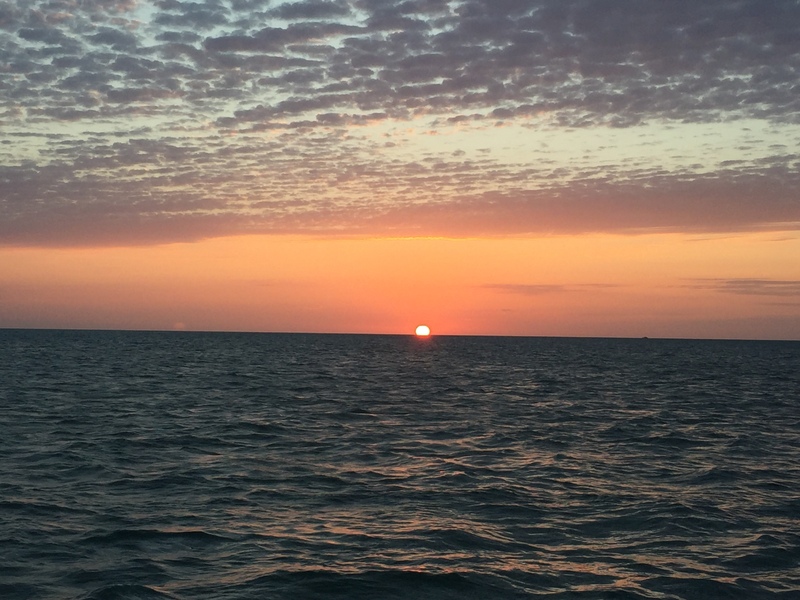 When we left, we left from Key West and we planned to turn at N24.95.840/W082.34.186 to a course of 177 degrees T and then end up about 6 miles east of the Marina entrance, turning back along the coast outside of the Gulfstream. Once we got out there the Gulfstream was further south so we got an extra ten miles West before turning south and were able to head straight for the marina entrance avoiding the risks of the north shore arrival and subsequent westerly backtrack. The Gulfstream was VERY close to the north coast of Cuba at that time. It was about a 25 hour crossing. 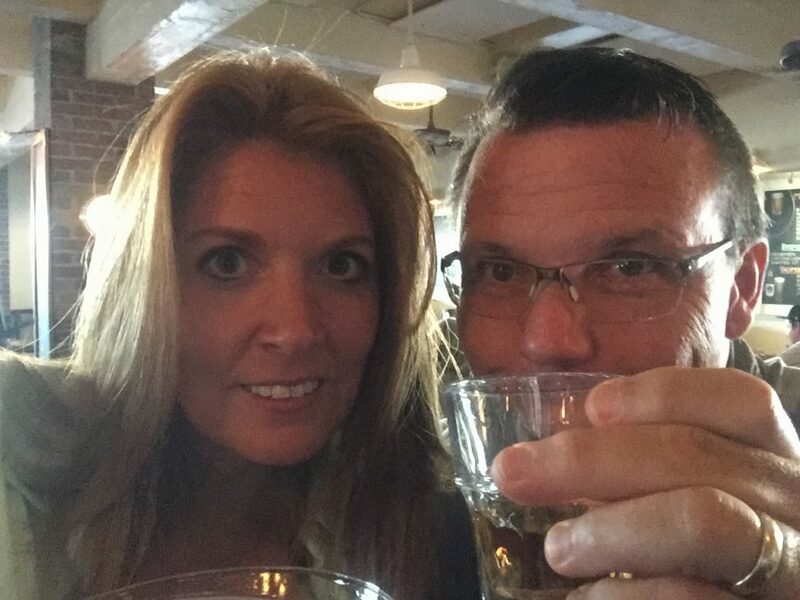 Next time…..how to get the “hook up” in Cuba for currency exchange, tours, rum, cigars and more……. We were hoping to make a late December getaway to the Bahamas since November was preempted by some return trips to visit and support family, but on December 26th I was paid a visit by the kidney stone fairy. 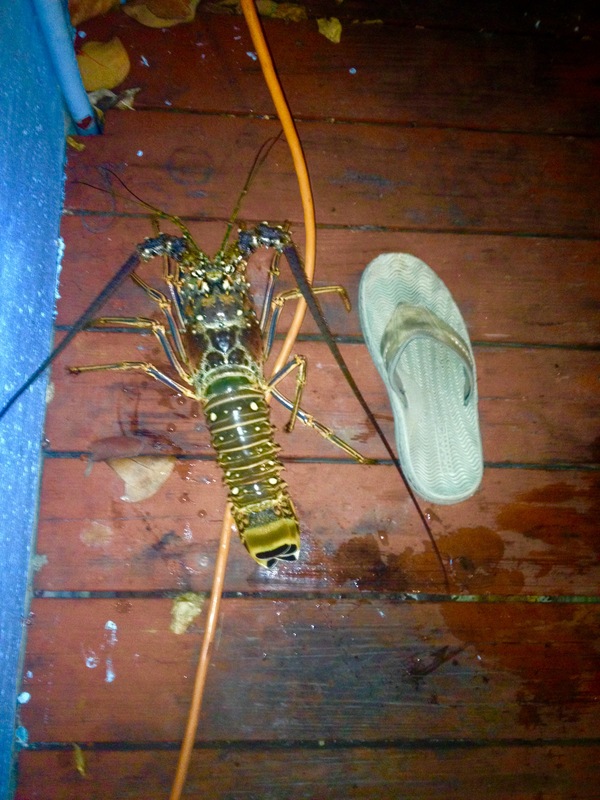 I’m very glad we weren’t in the Bahamas as this was my first time dealing with one of these. On the pain scale of one to ten I’d give that experience a 12…..I was told by the doctor that I had two more waiting in the wings so we thought it might be a good idea to take this opportunity to fix some things that we had been putting off while we were staying put for a while. We had a few projects……..Our watermaker had stopped working in the Bahamas, and that required diagnosis and repair…..we had some wood work that needed repair from some very old water damage,……our alternator needed a rebuild and realignment……the adjacent engine driven, high pressure watermaker pump also needed to be realigned……our refrigerator and freezer compressor had originally been wired in the same circuit which I thought was interfering with the performance when both units tried to start up at the same time,….. our wifi range extender was on the fritz,…… our new outboard was due for it’s ten hour service and our backup, new to us, outboard needed some work as well, and our masthead wind instruments (which supply the wind speed and direction to our instruments) stopped sending data to our cockpit display for some reason and finally our refrigerator evaporator plate needed to be replaced. Keep in mind these projects were tempered by trips to the beach, happy hours and visiting friends !!!! Our watermaker was a two fold issue. Our low pressure pump, which feeds the high pressure pump wasn’t moving any water. It is an intermittent duty (i.e. 30 minutes on and 30 minutes off) pump and required a cooling coil to keep the temperature down and extend the duty cycle. Unfortunately, the cooling coil couldn’t make 100% contact with the motor so it suffered from some efficiency issues. I had initially assumed that the motor was burned up. I removed the pump and was about to order a new one. I had hoped there had been some advancement in pump design and we could get a continuous duty pump, but apparently there haven’t been any advancements in this type of pump design. I thought we were destined to replace the pump for $395. As I was taking the pump to the trash, I decided to try something and I attached the leads to the battery in our van and the pump ran !! 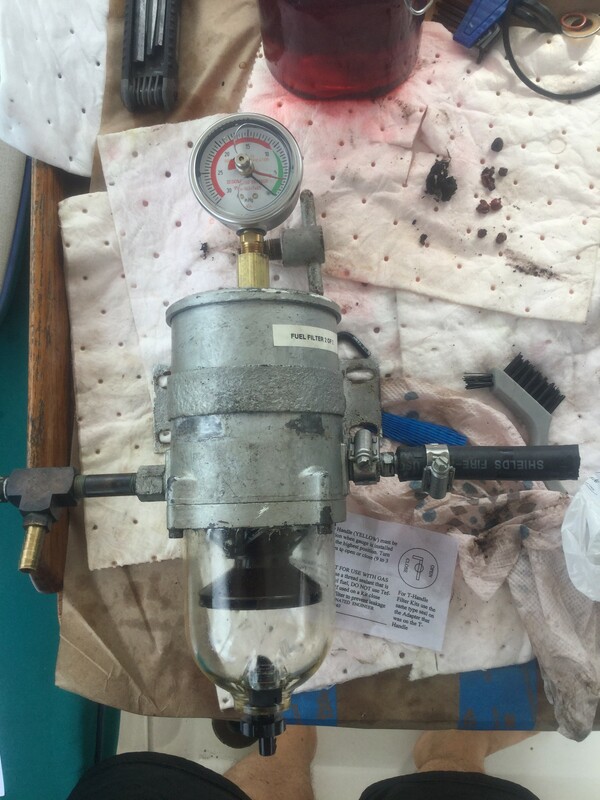 So, I found a local pump repair shop and got it rebuilt for $65…although, it took over two weeks to get the parts. Once the pump was rebuilt I began to investigate other ways to cool the pump and extend the duty cycle. I discovered that Shur Flo pumps makes a 5″ heat sink that fits the motors on a variety of other manufacturers pumps. I get the feeling the motors are all made by the same company and relabeled for the “manufacturers”. I consulted with a friend who was an aerospace engineer for ideas in cooling the pump motor and he recommended “Thermal Grease” under the heat sink. This makes the contact between the sink and the motor housing 100% by removing air gaps and the grease has metal particles in it to transmit heat more efficiently. I added a 138cfm cooling fan like you’d have on a large computer and fabricated a support from a PVC bus hub and a rubber reducer coupling and ended up with this …..we flushed the system and the motor was as cool as a cucumber !!! The “woodwork” turned into tearing out 60% of our port settee and replacing the entire seat and a small section of the outboard bulkhead that separates the storage area. I used marine grade plywood and treated it with Copper Coat which is a 9% copper solution that prevents future mold, mildew, rot and insect infestation. I also increased the size of the access hatches so we can store dive tanks under the settee. The biggest challenge was matching the shape of the board that was glassed into that area which would not come out in one piece…or even six !! A lot of the outer edge had to be ground out of the fiberglass. I took this opportunity to run some extra 0 gauge wire forward for the addition of some electrical items down the road. I was tempted to remove the washing machine during this process, but decided we could do that later. Since there’s an upcoming period of unsettled weather headed our way, (prediction is 20-25 knot winds for three to five days) I thought this would be a good opportunity to talk about how we keep ourselves entertained while staying on the boat for extended periods. Sometimes that can be three or more days straight depending on where we are and how severe the weather might be. We like to anchor away from the crowds but that results in longer (and wetter) dinghy rides to and from shore. We spend all but about two months a year on board, so keeping ourselves entertained can sometimes be a challenge. I have reached a point where I am reading about a book per week. That can be challenging since maintaining an inventory of books in our limited space isn’t really a viable option. It does present a chance for us to resurrect our old “book club” of which Kim and I were the only members. It was very exclusive! I discovered a series of books by F. Paul Wilson which mostly revolve around a character nicknamed “Repairman Jack”. These books are set mostly in late 1990’s NYC and Jack is a sort of a private investigator/fixer who becomes increasingly entrenched in unusual cases and circumstances that have a supernatural cause. Jack is sort of a Libertarian / polar opposite to a “Ray Donovan” type. The first book in that series is “Cold City”. There are related story lines that make up a series of about six books called the “Adversary Cycle” which start with “The Keep” (set in 1941) which was also an 80’s movie of the same name, that butchered the story line. If you like fiction drama/mysteries with some supernatural twists, I highly recommend these books. I also picked up a Jack Reacher book called The Killing Floor which turned out to be much better than the movies. I can’t imagine why they picked Tom Cruise to play the guy described in this book?? I also read a couple of Randy Wayne White’s “Doc Ford” books which are turning out to be good reads…..thanks for that tip Mike !!!! I have found my Fire Tablet aka Kindle to be indispensable. Now that we have on board wifi I can download books at will !!! We can also access Amazon videos and games on it ! We didn’t have an opportunity to get a “Bahamas phone” until our second trip to George Town. That has made things much easier as these phones come with wifi hotspots. BTC (Bahamas Telephone Company) recently started offering unlimited data for $35 per month. Now we can watch online movies and tv shows through a variety of applications for free !!! Let me know if anyone wants the details of those and I can email them to you. (They work stateside too so you could theoretically eliminate your cable or satellite tv bill.) If you’re planning to be in the Bahamas for an extended period be sure to pickup one of these phones…..you can get a Huawei brand smartphone (pronounced Wowee) for about $59 plus $16 for a SIM card on a prepaid plan. I found this link for an unlocked Huawei phone on Amazon which might work throughout the Caribbean if you get sim cards for each place you visit…..that also makes the blogging easier !!!! We also love to play board games. But, space again is an issue….board games are out, so we have mostly dice games on board. We play a lot of Yahtzee, we were recently introduced to a new dice game called “Farkle”….and we have a set of dominoes on board if we want to play “Mexican Train”…..it’s a fun game that was taught to us by our dear friend Joan in Florida …..
thanks for the introduction to “Farkle” Doug and Barb on SV Melinda Kay !!! Posted on April 13, 2017 Categories About us, Costs and budget, Experiences, Gear, resources4 Comments on Entertainment while afloat …..
Well, here’s part two…..as promised….sort of…haha. As I began to assemble the remaining photos of our weeks in Key West, I realized we didn’t have as many shots of us “partying” as I thought. Perhaps it’s a sign of our age, our recent change in lifestyle or maybe we just forget to be camera happy once we hit the happy hours ? 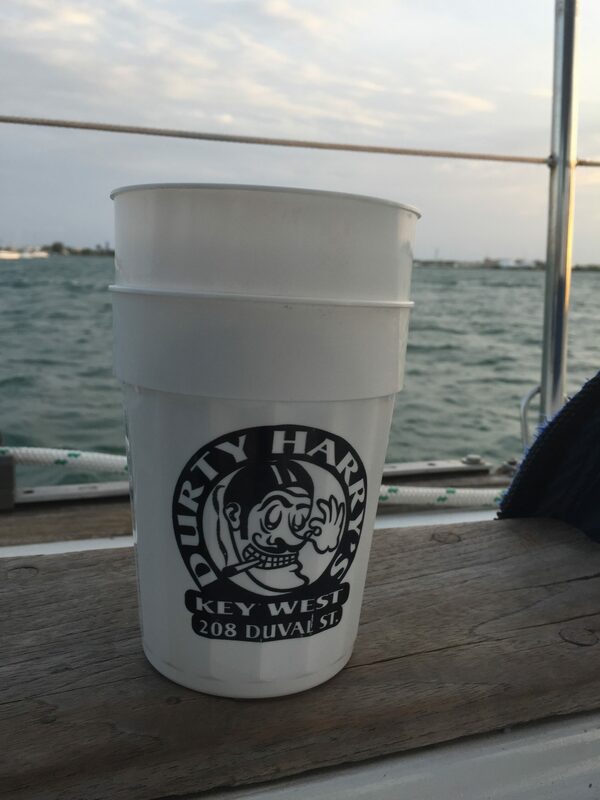 Either way….I need to remember to get a few more shots once happy hour starts !! This post, while shorter on “party” than expected, still has a lot of new, never before seen stuff !!! ENJOY !!! This scene above seemed a tad bit like overkill. 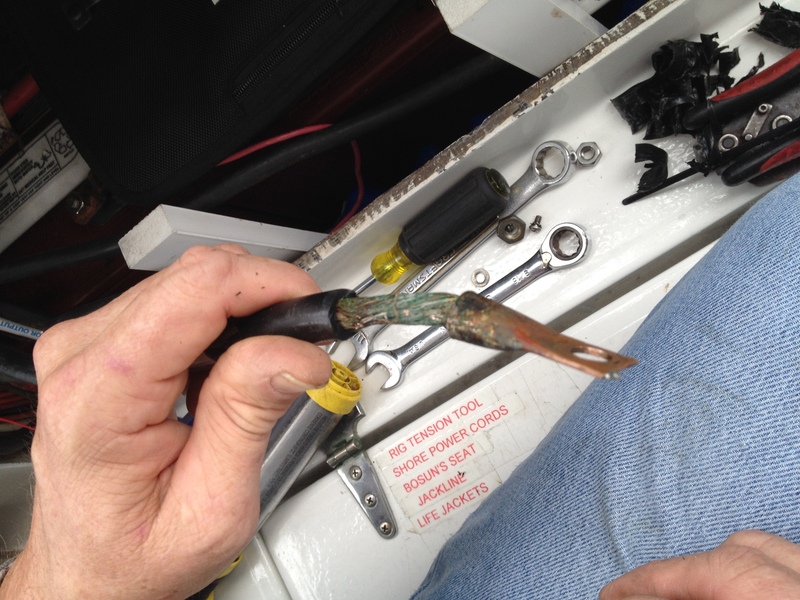 We had an issue with our outboard engine “deadman” switch/ kill switch. 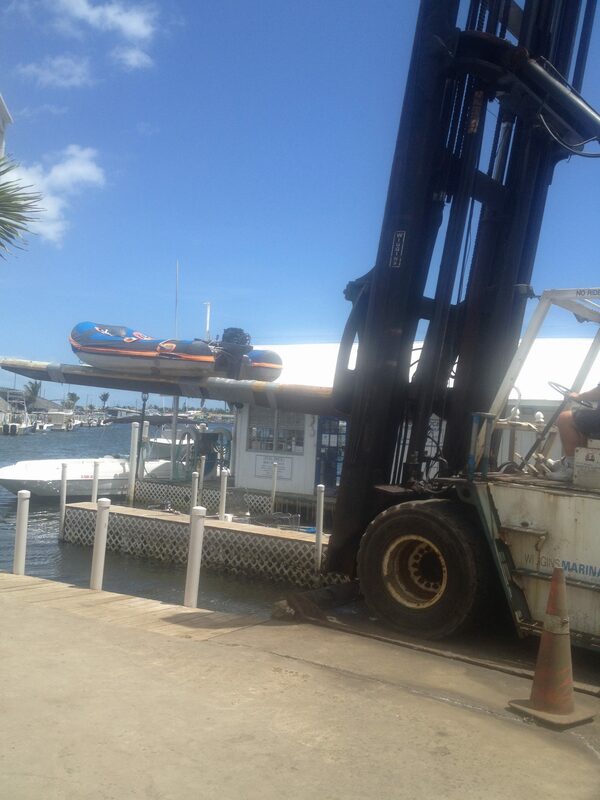 We had contacted the Garrison Bight Marina to check on the availability of the parts to repair it. 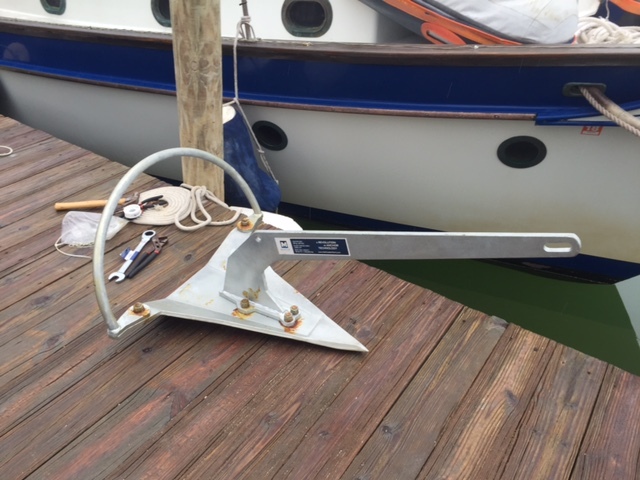 Since our outboard was originally purchased overseas, they couldn’t guarantee the part number they had in stock would fit. They offered to have their mechanic test fit both versions to make sure it was right. Since it was only a few more dollars to have them replace it and get a full warranty for labor, we decided to let them do the work while we had lunch at the Thai restaurant next door. I thought the mechanic would just walk down to the dock, but they opted for a full blown haulout of our 9′ dinghy, for which we also weren’t charged, but was fun to watch. 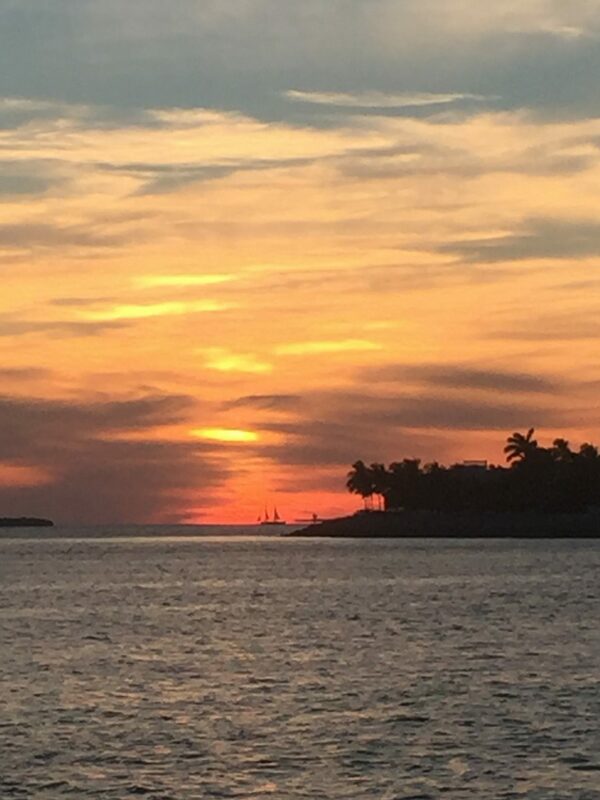 A shot from Mallory Square at sunset….that might be the America 2.0 out there ….. 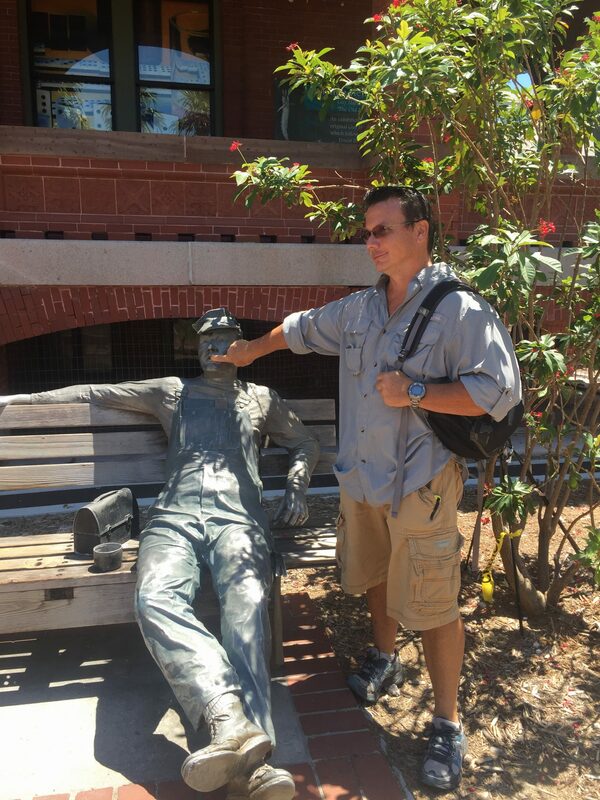 This guy is part of a semi permanent outdoor exhibit at the Key West Museum of Art and History on Front Street at the Old Customs House. The Old Customs House, as it is known historically, opened in 1891. 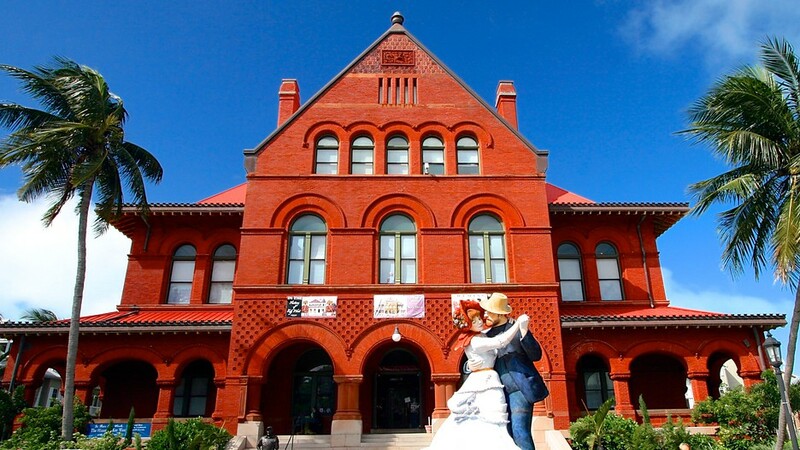 It currently houses the Key West Museum and History Center. 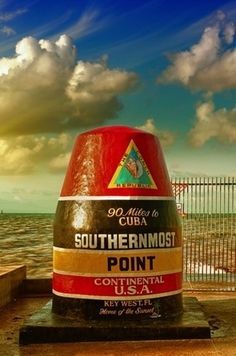 It has been, and continues to be, one of the most striking structures in Key West. It somewhat reminds me of Music Hall in Cincinnati design-wise, despite their technically different styles and size difference. 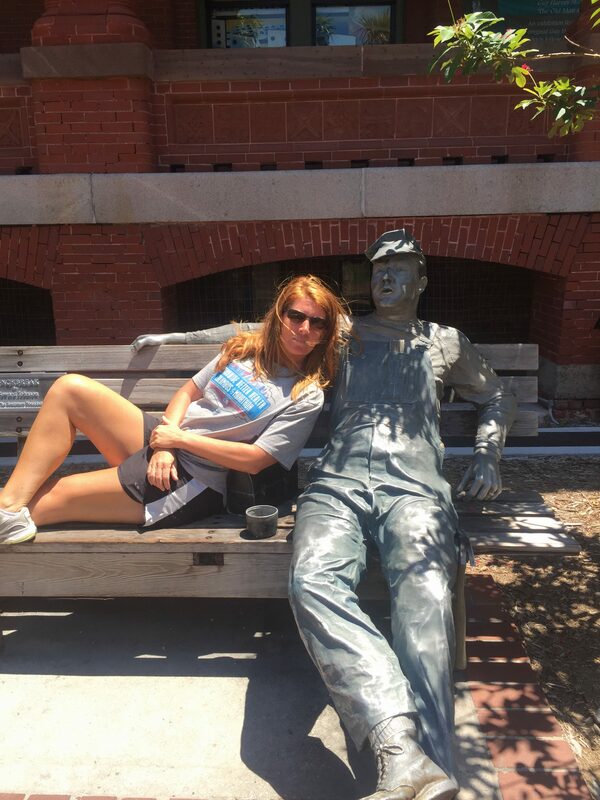 The photo above is the “Lunchbreak” a bronze statue by John Seward Johnson II. Johnson, an heir of the Johnson & Johnson talcum powder empire was, ironically, fired from J&J in 1962 by his uncle. That didn’t seem to affect him much financially. He is also a first cousin of the actor, Michael Douglas, on his mother’s side. Seward was initially a painter and turned to sculpture around 1968. His work has received a lot of criticism since many were simply sculptures based on impressionist paintings or iconic photographs and have been described as “kitschy”. I seem to recall reading an article somewhere that his larger sculptures were constructed by teams of fabricators under his direction, which may have generated some other criticism. Johnson was a diagnosed dyslexic and attended the Forman School which specializes in the education of people with Dyslexia. These shots are actually the light house on Loggerhead Key west of Dry Tortugas and a nearby sunset, but I thought there were so nice I’d post them again…..
One of our neighbors in the Garrison Bight Mooring Field was a seaplane that would usually arrive on Monday, tie up to a small floating platform that was tied off to a mooring ball. 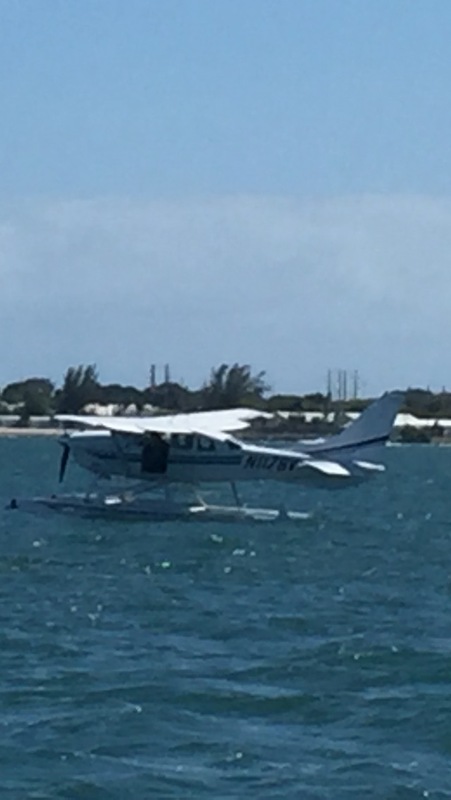 It was met by a small powerboat that was either picking up or dropping off the passengers for the plane. It was pretty cool to watch him land and take off especially since the prevailing winds were regularly at least 15 from ENE to ESE or so. 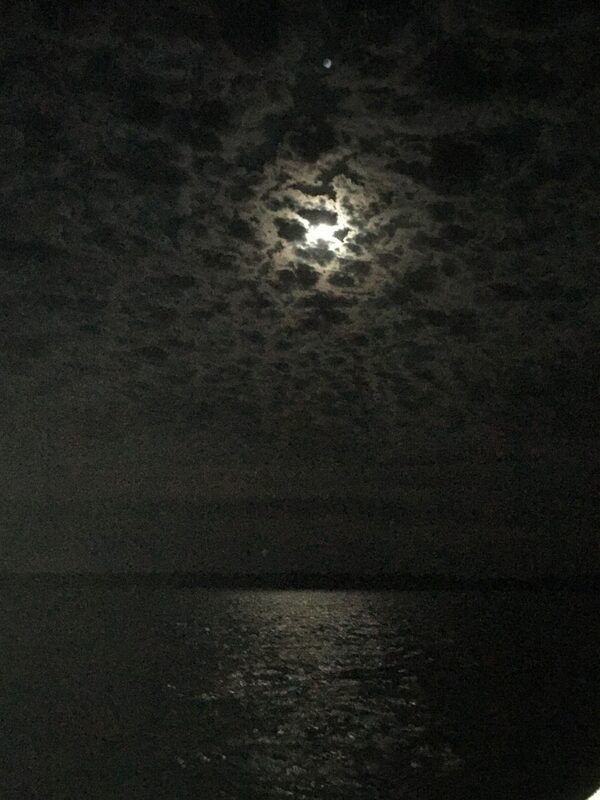 This was beautiful moon view in the mooring field …..it only photographed so-so unfortunately…..
Posted on August 9, 2016 Categories About us, Costs and budget, Experiences, photosLeave a comment on Key West Part Two…. Recently, I discovered the Amazon Associates program. Since we order a LOT of stuff from Amazon and have found it a great source for parts at affordable pricing, I was pleased to discover this. Essentially, whenever we mention a product in a post, we now have the ability to add a clickable link in the post for the product that will take you directly to Amazon where you can purchase it. It isn’t limited to products but may also be an ad for Amazon Prime (which I’m not sure how I lived without) or some other promotion being conducted by Amazon. We will still have the Google Ads in the posts as well, but the Amazon links will be clearly marked “Amazon” at the borders. Even if you don’t buy the specific linked item, you can use our link to access Amazon and help support our blog since we still get a small commission when you buy items or gift cards through one of these links !!! MOST IMPORTANTLY …..IT IS AT NO EXTRA COST TO YOU !!! In the interest of full disclosure, if any of our visitors use the link AND purchase the item or a gift card, we do get a small commission….. Please let me know if you think it makes the blog less enjoyable……I’m not a fan of too much advertising, but I also like saving time by avoiding research to find a recommended product I see online, outside of a retailer. I’ll do my best to keep them at the end of the posts to avoid clutter, but please let me know if you’d prefer them nearer to where the product is mentioned. Thanks for reading, supporting our blog and I hope you enjoy the posts and any products you might buy !!! Things we fixed (aka broke) along the way…. 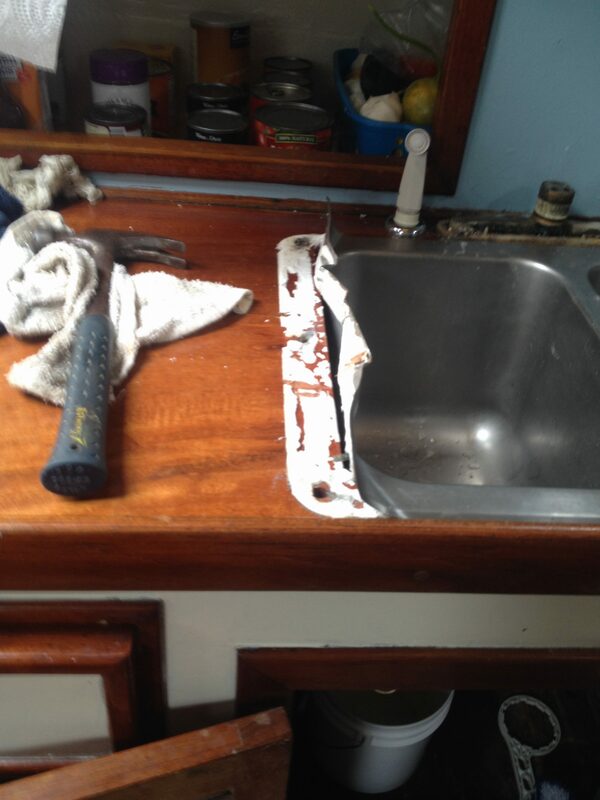 Galley Faucet….this began to leak and reached a critical point while moored in Key West…..the faucet was so old that the owner of a plumbing supply warehouse, who was in the family business for 50 years said he hadn’t seen one of these in 35 or 40 years!!! 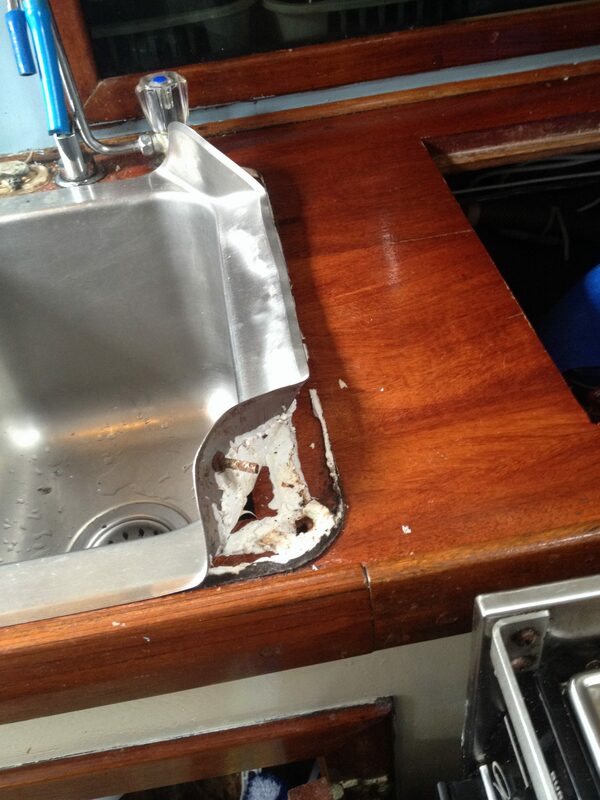 Galley Sink….at some point in our boat’s history….someone (possibly a sadist) used 3M 5200 to seal the sink to the countertop…..for those of you unfamiliar with 5200, it’s a great product for installing things you want to be bulletproof…..it’s not so great for something you might want to remove….ever……even employees at boatyards groan audibly when they learn they have to remove something installed with 5200….it has been nicknamed by some “death paste”. The upside is, since the edge of our sink was so severely damaged during removal, we had a custom single bowl sink fabricated and installed …..if anyone needs such a replacement let us know we have a great source for these sinks !!! Power switch for VHF radio….which completely deteriorated and fell apart in my hand when we went to switch on the radio to check the weather in the Dry Tortugas….. 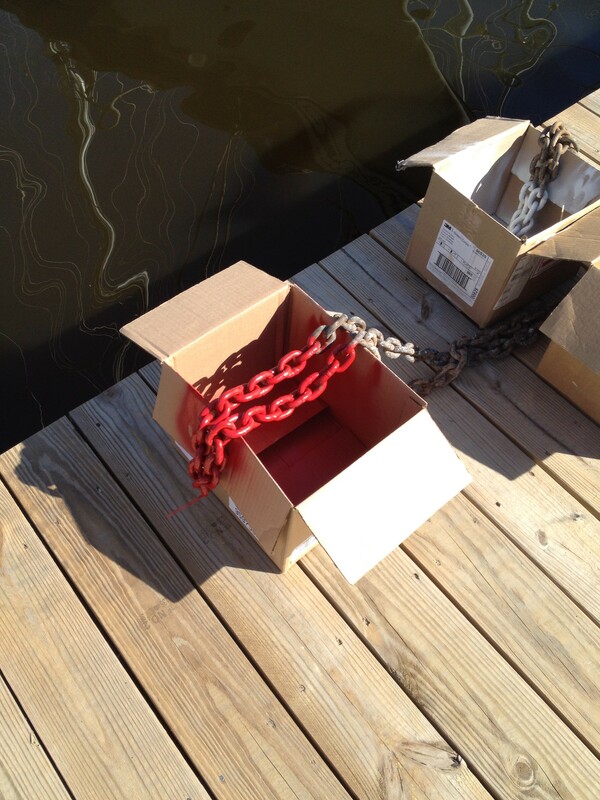 Remove lines from props ….five times….one with a crab trap on it….no bonus crabs though…. Posted on July 28, 2016 August 1, 2016 Categories Costs and budget, Experiences, Gear, Maintenance, Our boat, photos, resources, When things break or go wrong3 Comments on Things we fixed (aka broke) along the way…. 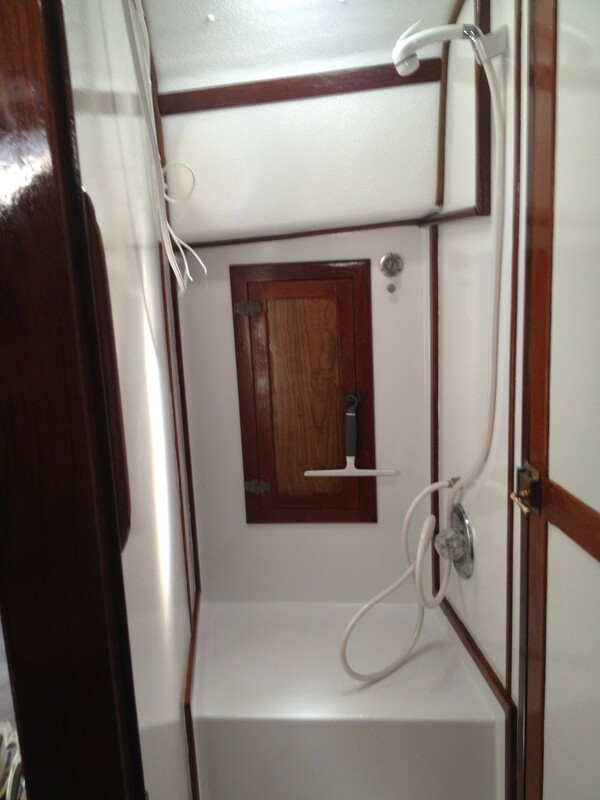 So,….How much does it cost to live and travel on a Sailboat ???? Aspiring cruisers frequently ask the question “What does it cost to do this?” …..that’s tough to answer unless you keep records for a few months, at least. Plus it can be difficult since boats and their systems come in various sizes and levels of complexity. The larger the boat and the more systems you have on board the greater the associated costs. We feel like we live pretty well on Kitty Hawk. She has a nice balance of systems and amenities without feeling like you are camping on the water. For us, generally speaking, we run between $3,000 and $4,000 per month. Some months if we don’t have an upgrade or repair and we anchor out more, we are closer to that $3k number. Some of our friends who cruised in the 1980’s have told us they could get by on as little as $300 per month !!! Looking back, my first car in 1982 cost me $400 !!! Kim, fortunately, is becoming meticulous when it comes to documenting our expenses on a daily basis. Now that we have a full year under our belts, I thought it was time to put all of her hard work together into a post. 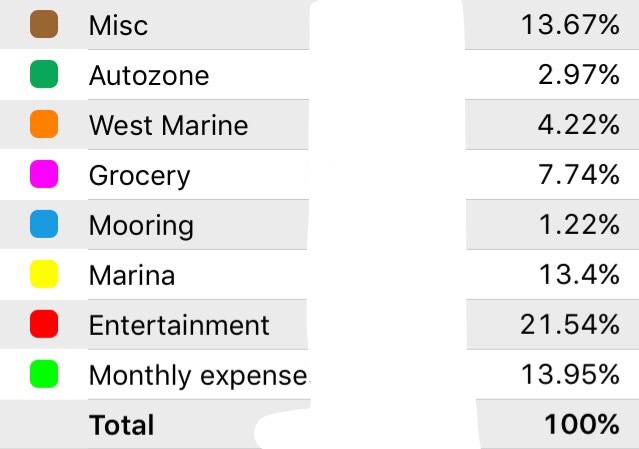 Since the process of categorizing expenses has taken some time to refine, I decided to limit this first accounting to the last six months. That should help to make this more understandable. 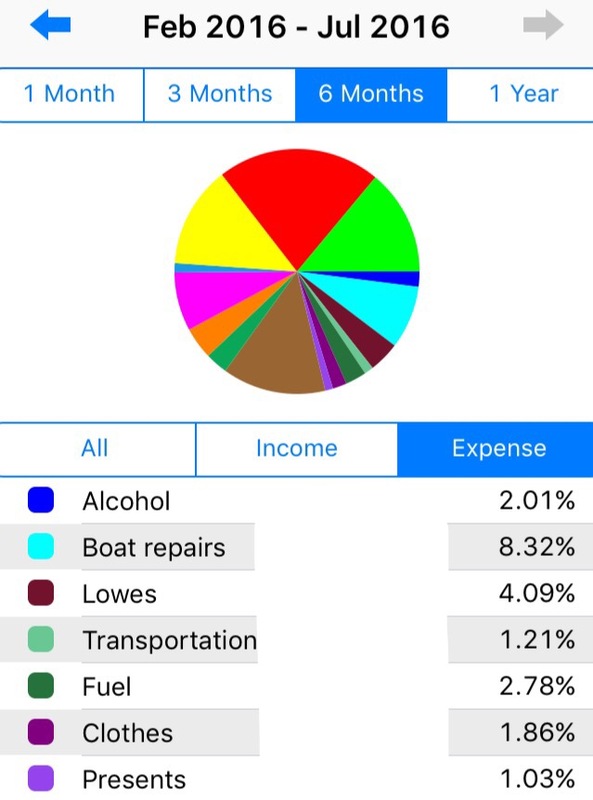 Unfortunately, the app we use to track these expenses can’t export the information. We have to use screen shots of the reports, so the resolution isn’t the best but you’ll be able to see how things break down percentage wise. It seems like the first half of the year is always the most expensive. Since hurricane season starts on June 1, that tends to be the time when we get any professional assistance with any needed repairs started. We also pay for our annual hurricane haulout reservation in May, which adds between $250 and $500 to the budget. There was also about $2,000 of extra expenses, due to some poor work we had done in North Carolina in 2015, that not only required corrective repairs but caused some damages that needed repair also. There are some front loaded services for the year that come up and we are in the process of dividing these up over the whole year. The average for this last six month period was about $4,480.00 per month. Adjusting for the extra repairs this number should be more like $4,100.00. I feel safe in saying that this number will continue to go down as we move forward. Our rough numbers for the twelve month period was closer to $3,000 per month. I hope our upcoming years will be closer to that $3,000 mark, or less !! Our largest category, Entertainment, covers anytime we eat out, away from the boat, or any other land based excursions (Parks, tours or the like). 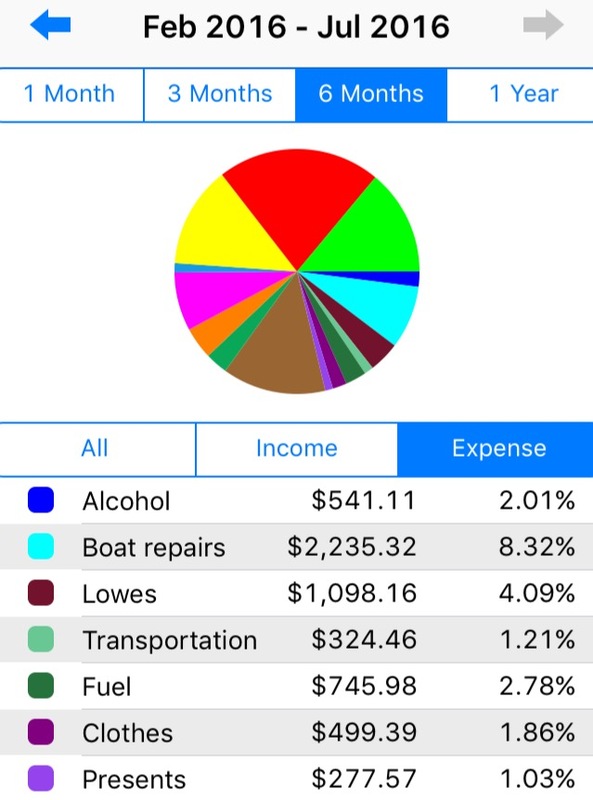 The second largest, Monthly expenses, includes set, recurring expenses. Things like XM Radio subscriptions, cell phones, our MiFi hot spot, DAN insurance, Boat/car/life insurance, personal property taxes and membership fees fall into this category (our old sailing club dues, our current marina association, Elks club, etc). In third place we have Miscellaneous, that includes things like income taxes, laundry, health/vision, other supplies, fishing gear, scuba gear, and hotels. Transportation includes, taxis, buses and rental cars. Fuel includes both the diesel for the boat and gasoline for any vehicles we use along the way, plus the gas for the dinghy and dive compressor. “Lowes” is our catch all category for any hardware store expense. The Marina category covers any docking expenses or other fees incurred while at a Marina or private dock (Wifi, water, electricity etc). We will compile another report like this in another six months and include both periods to see how the expenses shape up once we have all the categories locked in. 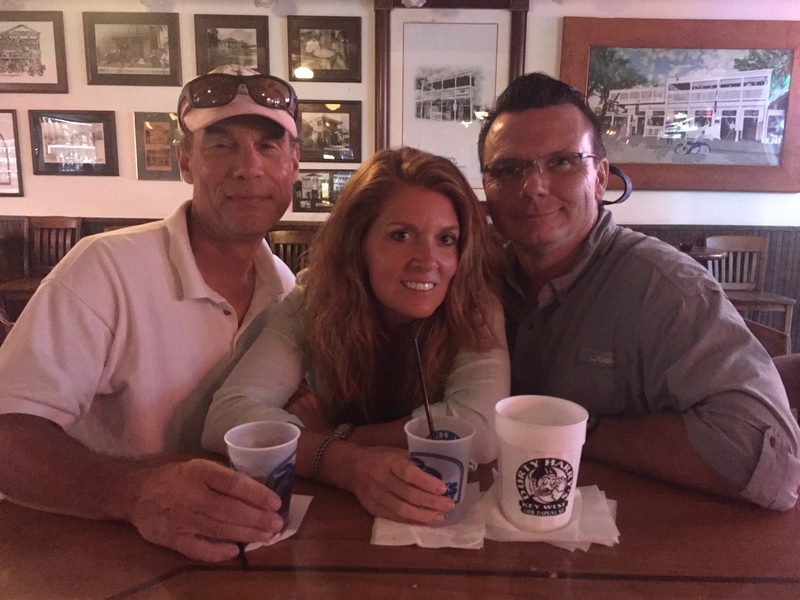 Never fear….the Key West Post is still coming…..it’s still in the draft phase…. Posted on July 20, 2016 Categories About us, Costs and budget, Experiences, Maintenance, Our boat, photosTags costs of living aboard, expenses, Sailboat living expenses3 Comments on So,….How much does it cost to live and travel on a Sailboat ???? I’m not sure what the lobster season has been like offshore near the reefs but if it’s been anything like it has been on our little part of the bay it must have been great so far. I was hesitant to spend the $25 for the five year license initially but at $12 or $13 per pound (even at the places that buy them straight off of the boats) it paid for itself in about the first day. The season runs from August to the end of March and there are two “mini-seasons” that are two days each in the summer time. 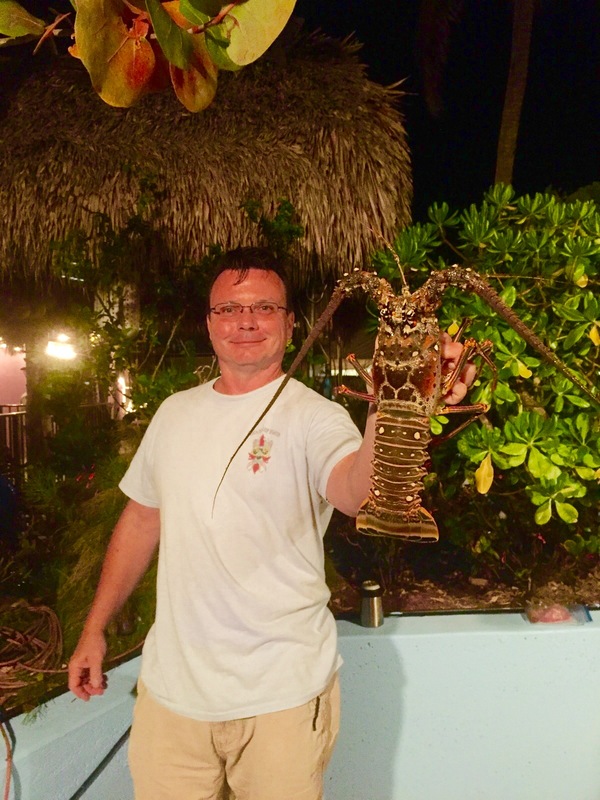 That’s a heavy lobster …. and what happened next ??? He ate it…. As we approach the end of our first year as an official blog I have become curious about how many visitors we have had to our little site. As many of you who know me personally are aware, I can be somewhat technologically challenged. This hasn’t been an easy learning curve for me and I’m certain that I am missing out on a lot of blogging shortcuts and probably money making angles in this whole venture. I had hoped our Google ads program would have been more successful, but maybe that will come in the future. Kim mentioned that the ads don’t seem to show up in the posts when she views them on her iPhone? If anyone else isn’t seeing them, please let us know and let us know what device you are using. Now, before we get too worked up…..a “visitor” can be the same person who visits more than once but, a little more digging, and I learned we have also had 969 unique IP addresses, which means almost 1,000 different people (or at least devices) have seen our blog….and that’s pretty exciting…..or maybe one person who travels…..a lot…or owns a LOT of routers ……haha. This data has somewhat buoyed my optimism. Since we don’t spend a lot of time in the same place it can be tough to get repeat marine services business so we are counting on the ads program to a large extent. Doing the simple things like cleaning boat hulls or replacing zincs in the water is a pretty saturated market anywhere we arrive and advertising outside the blog in each place isn’t feasible. I have received a few calls for repeat business, but unfortunately, we had moved on when the customer need had arisen again or for a new service. I’d like to thank everyone who has visited and supported us in this last nine months and I hope we can continue to post things you find interesting…..please feel free to send us suggestions of any topics or photos you’d like to see. I am considering adding marina reviews to the rotation of posts or maybe even restaurant or location reviews of areas we visit if that might be of interest? Well, it’s been a pretty eventful month, or so. We took advantage of our time in Oriental to upgrade our battery banks wiring and a few other things. Some of our battery bank cables were undersized, not properly crimped, our banks lacked a main fuse and our smaller bank had been wired in a slightly less than a fully efficient manner. We also installed two Bogart/Trimetric (Model TM-2030-RV) battery bank monitors which have made keeping tabs on our charging and battery bank status much, much easier. 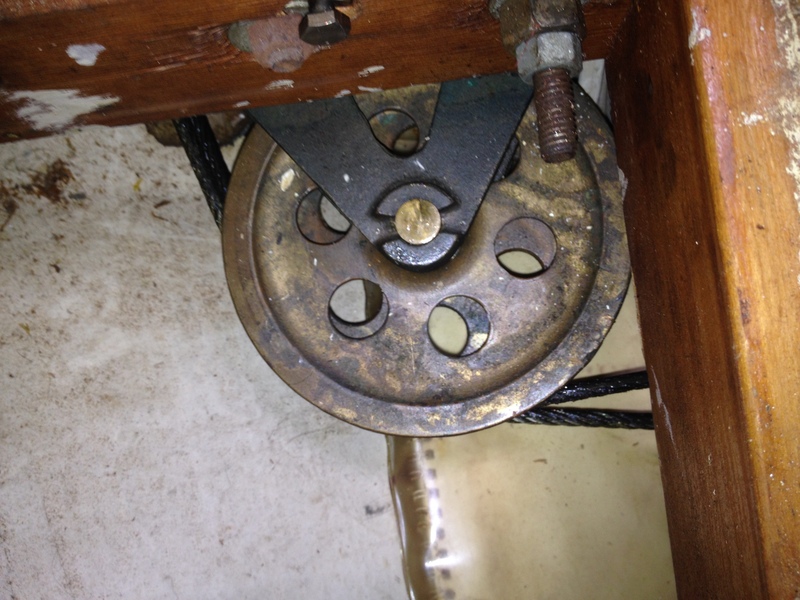 That’s one of the things about buying an older boat, she’s been through a few owners and while some were meticulous, some weren’t, and if a system is working one owner may never have had the need to address or investigate the status of the individual components that may not have been exactly “up to snuff” when installed by the prior owner, owners or contractors or the standards have changed over time in favor of better, safer or more efficient methods..
We also added a Blue Seas electrical master panel to our AC shore power system that has a 30 amp, dual pole, ELCI (Electrical Leak Circuit Interrupter, if your boat happens to develop a leak of AC current into the water while plugged into shore power, which is extraordinarily dangerous, it shuts off the AC power). The breaker itself has a sensor in it that measures the amount of electricity flowing out and compares it to what returns and if there is a slight difference it trips the breaker. We discovered once we powered up this new panel that our water heater was wired incorrectly since the new breaker tripped as soon as we energized the circuit. As it turns out, the wiring for the water heater was a commercial type of wiring (IEEE marine cable, intended for use on Navy and commercial vessels….with this type of wire red is ground, black is hot and white is neutral, so our water heater was basically wired backwards, which still allowed current to flow through the element but the new more sensitive breakers caught the difference in the polarity/voltage returning and shut it down) since the color coding was different it must have confused whoever originally wired it. It took an extra fifteen minutes to correct this and then things operated perfectly. 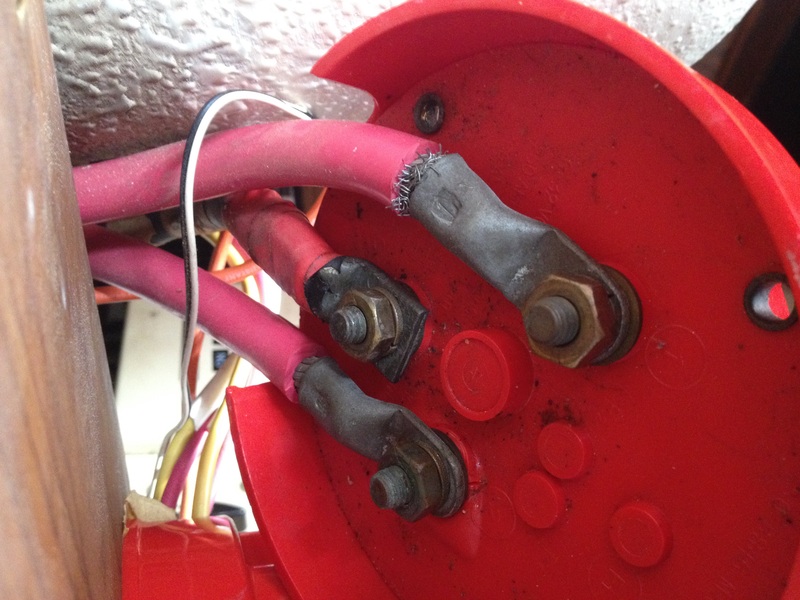 We also added a safety cover to the interior of our shore power plug connection which was missing. 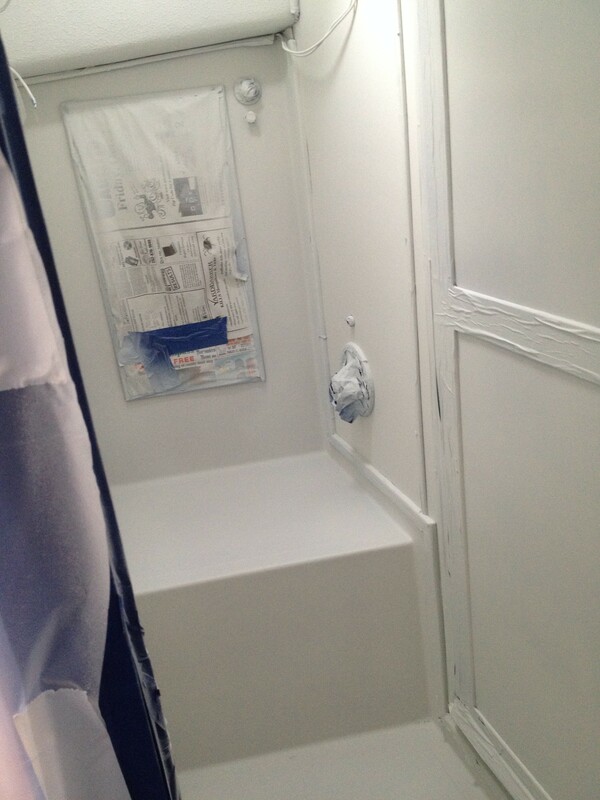 We also painted our newly re-plumbed and re-opened forward shower stall….. 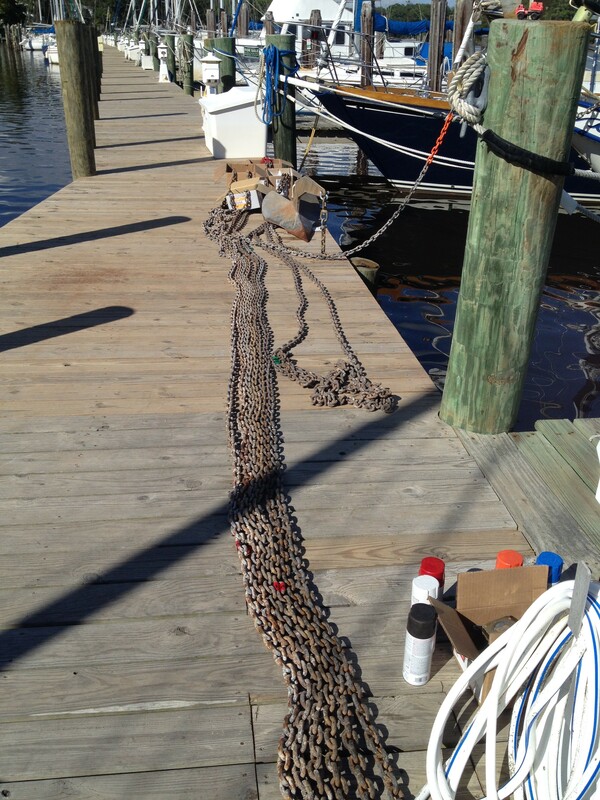 I also painted new length markers on our anchor chain and replaced the shackles….. I decided to go with Red at 50′, white at 100′, Blue at 150′ Black at 200′ and Orange at 250 just before the chain runs out and the rope rode begins. We’d also like to give some well deserved praise to Pete Waterson of Seacoast Marine Electronics (http://seacoastmarineelectronics.com/) in Oriental, NC. Pete is the owner and installed our new NMEA 2000 backbone wiring, AIS transceiver, a new Raymarine I70 display, a masthead anemometer and wind direction sensor which is now all tied into our Garmin 741XS chartplotter at the helm. 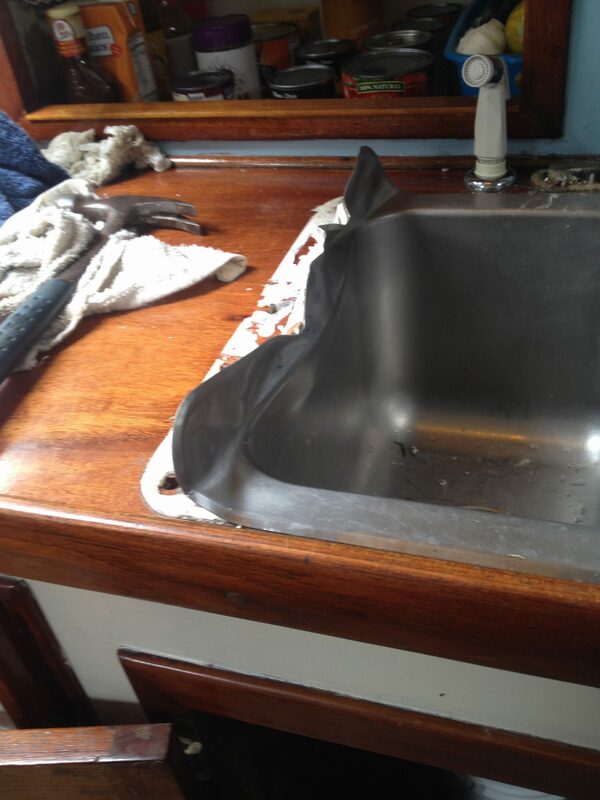 Pete also installed a new VHF antenna and Windex while he was at the masthead. Pete also helped me (or maybe I helped him) rewire our binnacle wiring and add a power/ground bus to clean up the connections there and eliminate some voltage loss and an issue with a weak ground. If you find yourself in Oriental or nearby and need any electronics or assistance be sure to look Pete up. He’s a great guy and his office staff (Jill, his wife and Betsy) are super friendly and helpful. We were later joined by our good friend, Mike, in Oriental, just in time for the Ol’ Front Porch Music Festival on October 17. It was a great day, beautiful weather and lots of good music and food. Apparently, this was a tradition among the old time farmers in the area and on Saturday nights they would come into town and play music on a variety of front porches around town. Time and progress being what they are, this tradition was slowly lost and has been revived during this once a year festival. The Carmona Brothers and Laurelyn Dossett were the final performers of the day and if you’ve never heard either of these, I recommend looking them up online. We waited for some weather to pass and departed Oriental on October 20th around 8:00am. It was a nice trip. We arrived around 11:45am in Morehead City, NC since we wanted to make the first day short and non stressful…then Murphy reared his ugly head. As we approached Portside Marina in Morehead City a large tugboat that was bow in at the state port abruptly moved astern into our path. I was forced to throw Kitty Hawk into full reverse to avoid colliding with the tug. As the dust settled from that encounter we again proceeded toward the Portside Marina face dock. There was suddenly something very wrong. It took about five seconds for me to realize that for some reason we were no longer getting any forward propulsion. I immediately shifted to neutral, then tried reverse and got the same result….no response …I could hear the transmission shifting and assumed we had lost our throttle cable. After advising Mike and Kim that we were going to be coming into the dock at about 3 knots SOG (speed over ground) I called the marina hands on the dock on our VHF radio to let them know. We managed to dock pretty easily, all things considered, despite coming in at what felt like warp speed. Once we got settled, we diagnosed the problem and it was, in fact, the throttle cable that had broken just below the shift lever. 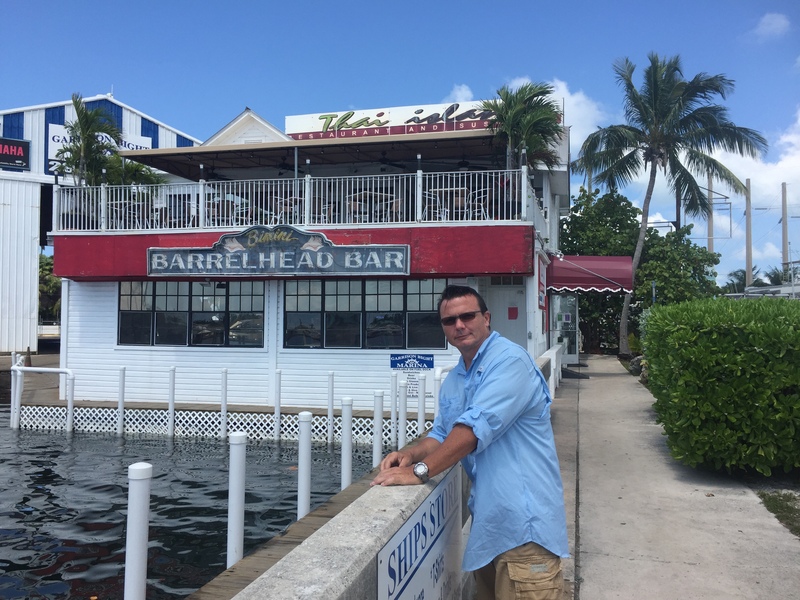 I spoke to the owner of Portside Marina, Denard, who is a super nice gentleman. 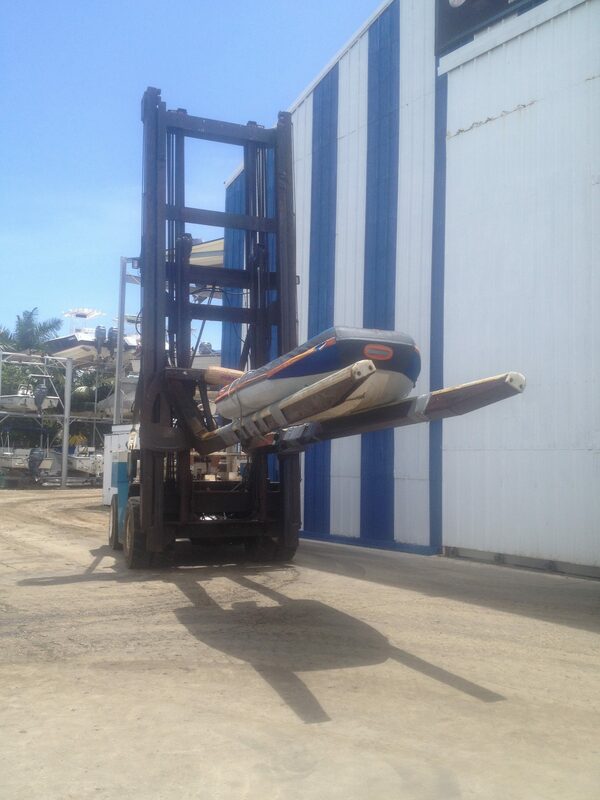 He not only found the part for us, but let his brother in law, who works at the Marina, drive me over to get it. The cable was replaced two hours and $27 later…..Portside Marina is the only place I’ve ever walked into and been immediately invited to partake in the employee lunch. They were having fish one of the guys had caught and a local restaurant fried them up for them….talk about hospitality !!! 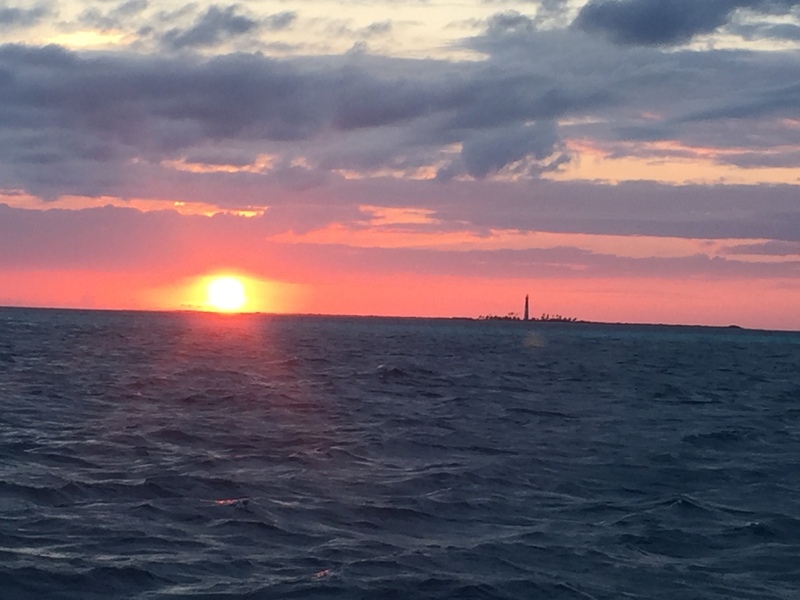 Our trip South was Kim’s first long distance trip on Kitty Hawk….she got her first experiences in the ICW (and her first grounding, so that’s over and done with), navigated out of the Cape Fear Inlet and made two overnight offshore trips. One was between Cape Fear, NC and Charleston (a rough one) and the second was between Port Royal, SC and Jacksonville, FL. During the first hop we even got the wind to cooperate and we sailed for 6 hours. 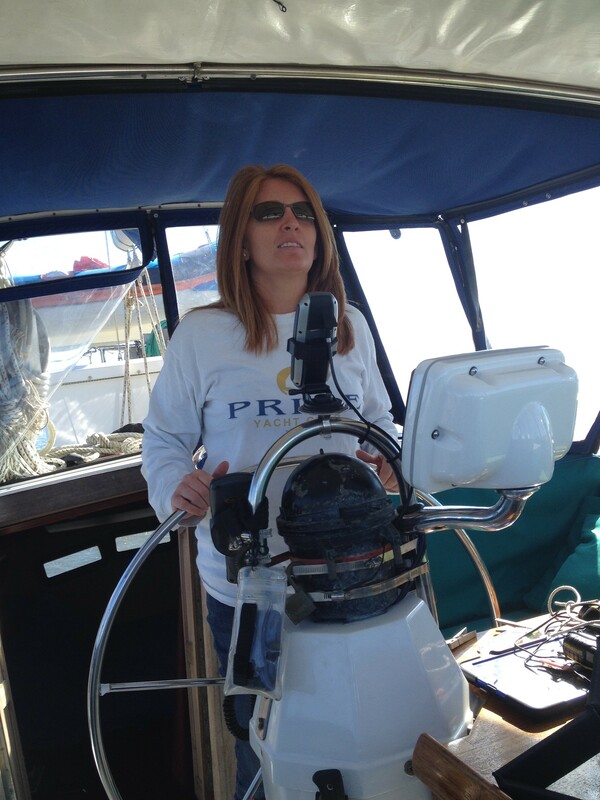 The Admiral at the helm…..
Next time I’ll detail our stops at Beaufort, SC and St.Augustine, FL and share our ghost video from Facebook if you haven’t seen it yet…..
Posted on November 14, 2015 Categories Costs and budget, Experiences, Gear, Maintenance, Our boat, photos, resources2 Comments on Upgrades…..then…..Southbound and Down…..